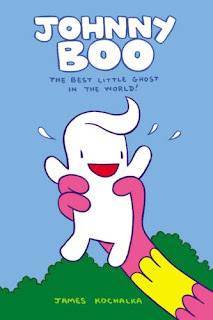 Johnny Boo: The Best Little Ghost in the World! Just look at that cover. With his tiny body and curly head, Johnny Boo just might be the cutest ghost ever (Sorry, Casper.) In this book, Johnny roams the forest with his pet ghost Squiggle. They frolic, drink melted ice cream, sometimes hurt each others' feelings, and reconcile. Of most importance, they encounter a pink and yellow ice cream monster who turns out to be friendlier than he seems. Still, somehow Squiggle ends up in its belly. This book is the work of Renaissance man James Kochalka. Kochalka has published a daily cartoon since 1998 called American Elf. He has also published a great number of original graphic novels including Pinky and Stinky, Peanutbutter and Jeremy's Best Book Ever, and Monkey vs. Robot. He won the 2006 Harvey Award for Best Online Comic and four Ignatz Awards over the years for his other endeavors. In addition to drawing, he also teaches at the Center for Cartoon Studies and is a recording artist. His band, James Kochalka Superstar has released 9 CDs. Most reviews are positive and highlight that this book intended for young readers also has appeal for older ones. Leroy Douresseaux commented that "although this book is for children under 10-years of age, even older readers can like its sweet, playful ambiance." Kris wrote that "this book will captivate the young and young at heart." Peter Gutiérrez called it a "small gem" that is "sweet without being sugary." This volume is the first in a series of four (so far). A preview is available from Top Shelf. Long before all the reality TV shows, dance has been attractive to people as an event, a way to celebrate, and an artistic endeavor. All three of these aspects come through in To Dance, an autobiographical story. Beginning at an early age, Siena was drawn to dance. She took lessons as a young girl and kept at it until she was accepted to the New York City Ballet under George Balanchine. During her time there, she got to thrill to brilliant performances and see famous dancers, including Mikhail Baryshnikov. The joy and dedication really comes through in Siena Cherson Siegel's story. This interview explains some of the reasons she wanted to tell it. The expressive and evocative art was done by her husband, Mark Siegel, a graphic novelist and children's book author who is also the editorial director of First Second, one of the most acclaimed graphic novel imprints in the US. This short interview lends a little insight into his life and work. 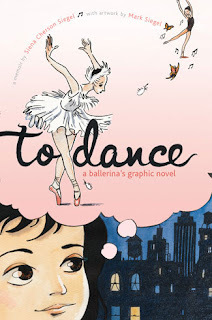 To Dance was a well received book, as evidenced by this list of four star reviews from some notable journals. It was among the American Library Association's Notable Books of 2007 and was also a Robert F. Sibert Honor Book. It is also exceptional as one of the relatively few graphic novels pitched at girl readers. A preview is available from the book's publisher Simon & Schuster. 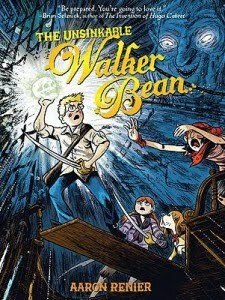 The Unsinkable Walker Bean has a lot going for it: beautiful art, an intriguing plot, and extraordinary story elements. Aside from the romance of being a castaway on a ship, the glimpses into deep sea trenches, and the fantastical creatures, the story is told alternately in small, personal vignettes and grand, cinematic moments. Aaron Renier really shows off his artistic and story-telling chops with this book, intended for readers age 9 and up. There is so much detail in this book that it is hard to describe, but I'll give it a shot: The plot centers on Walker Bean, a young boy who ventures off on a sea voyage against his father's wishes in order to save his grandfather. The eldest Bean has been struck ill by a mystical pearl skull and only by returning it to its point of origin can he be cured. Most people think such talk is foolish and baseless, but Walker sets off any way. During his journey, he encounters many strange and interesting characters, including a doctor who is constantly working against him, a friendly youth with a dog, a cat-like girl who is a master thief, and a cook who has a walking, robotic teapot helper. Not to mention the two giant mermaid sisters whose vanity and greed has transformed them into giant lobster creatures who dwell in the deepest parts of the ocean until they pursue the pearl skull. The Unsinkable Walker Bean is Renier's second graphic novel. His first, Spiral Bound, was very well received. He received an Eisner Award for Talent Deserving of Wider Recognition in 2006. This interview offers insight into his art and work in general. Reviews for this work have been very positive. J. Caleb Mozzocco commented on how much world-building he does in this book and states that it has "every chance of being the next big thing." The reviewer at Reading Rants wrote that he "couldn’t stop pouring over the intricately detailed panels" and commented on how it brought to mind some favorite children's books as well. James Bucky Carter stated that it was the "most enjoyable, fun, and exciting graphic novel I have read this year." A preview, excerpt, and activity guide are all available here from publisher First Second. As it is, this book is laid out to be the first of a series of adventures. Thanks to Gina for the review copy! 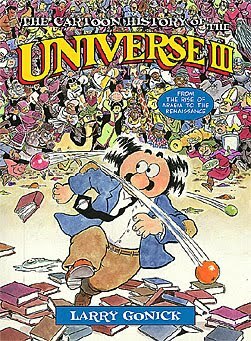 Cartoon History of the Universe Part 1 is here. Part 2 is here. A lot of ground gets covered in this volume. It details the life of Muhammad and the rise and spread of Islam. It also touches on Asian and African history, follows the exploits of the Turks and other nomadic peoples, and covers medieval life in China, India, and Japan. Some other high points include "the Dark Ages," Muslim Spain, and the European Middle Ages from the Crusades to the Black Death. The book goes on to cover the Italian Renaissance and various naval expeditions to explore the world, concluding with Christopher Columbus's historic departure in 1492. Larry Gonick wrote and drew this series of books, which has been coming out sporadically since 1978. This volume of the series won the 2003 Harvey Award for Best Graphic Album of Original Work, and has received many accolades. Reviewer Jerry Stratton raves that all the Cartoon History of the Universe books "should be on every bookshelf of the English-speaking world." Some sample pages from the book are available here. Another preview is available from publisher W.W. Norton. Camp Fielding is the answer to troubled parents' prayers. Unruly, troubled, and academically challenged kids check in, and obedient, respectful, and ready to learn young adults check out. And what's more, the camp is absolutely free, though you do have to receive one of their private invitations. Meanwhile at camp and outside of parents' view, the campers face some odd circumstances, including a high amount of camper turnover, strange skin conditions that affect people's foreheads, and the occasional coughing up of feathers. Jenna and Lucas enter into this "camp for losers," and begin to unravel what is going on. Lucas is a classic down-on-his luck kid. His mom struggles to raise him on her own, and he's fallen in with a bad crowd. Jenna's worst sins are being interested in drama and not following in her sister's footsteps and getting accepted into Yale at age 14. This unlikely pair are the last students excepted to the camp this summer, and they enter a world that is part arts and crafts, part Invasion of the Body Snatchers. 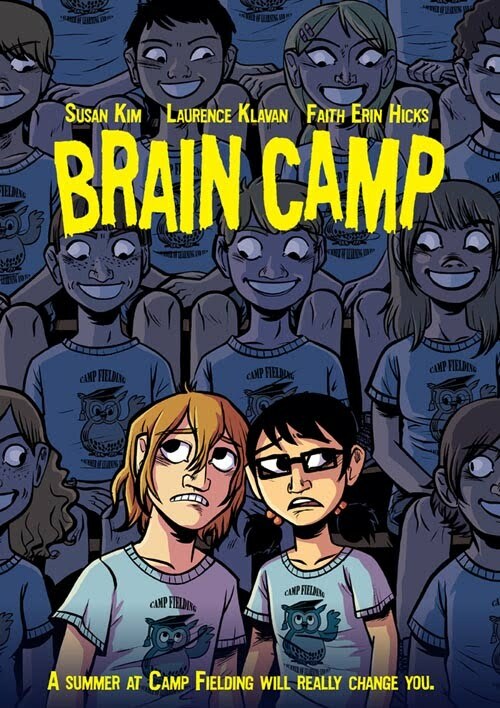 Brain Camp is the second graphic novel collaboration between Susan Kim and Laurence Klavan. Both are playwrights who also write for television. Kim has been nominated for an Emmy Award multiple times and is also famous for her stage adaptation of Amy Tan's The Joy Luck Club. Notably, Klavan is also a mystery novelist. Faith Erin Hicks provided the artwork. She has created a few of her own graphic novels, including The War at Ellsmere and Zombies Calling! From what I have seen, reviews have been mostly positive. 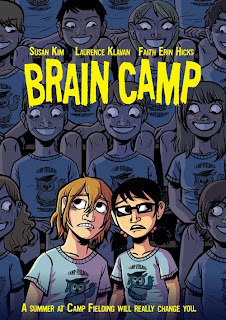 Jim Mroczkowski pointed out that Brain Camp is a graphic novel that does not insult adolescents' intelligence and called it "an excellent, unqualified recommendation for anyone who wants to get a young person into comics." Reading Rants found this "sweetly sadistic" story reminiscent of a scary campfire tale. Offering a contrary opinion, Johanna Draper Carlson wrote, "There’s an overall lack of cohesion, leaving me wanting more of the pieces that had nothing to do with the story while not particularly enjoying the predictable main plot." A preview and video trailer are available here from the book's publisher, First Second. Thank you, Gina, for the review copy! Robin Hood is a well-known figure in the English speaking world, a legend whose story has been told in print, art, and movies. This version's hero is cut from the swashbuckling Errol Flynn/Cary Elwes cloth. There are five different stories within. 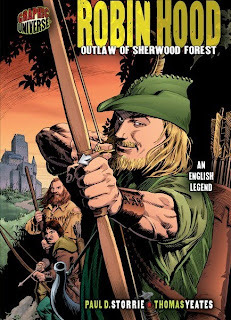 The first shows how Robin Hood was tricked and had to become an outlaw. The second and third show how he meets Maid Marian and grows his band of Merry Men. The fourth and fifth stories follow his disputes with the Sheriff of Nottingham. This book is another of the Graphic Universe graphic novels from the Lerner Publishing Group. It was written by Paul D. Storrie, a frequent contributor to the series about myths and legends, whose other titles include Hercules: The 12 Labors and Amaterasu: Return of the Sun. The art was provided by Thomas Yeates, a graduate of the Kubert School of Art who has had a long career illustrating a variety of comic books such as Swamp Thing, Tarzan, and Conan. The School Library Journal's Joy Fleishacker reported that this book would be a good one for struggling or reluctant readers, especially because it"includes a map, glossary, and pronunciation guide, and list of print and web resources, [which] may encourage readers to delve more deeply into Robin’s adventures." A few more brief reviews are available at Goodreads. The publisher's preview is available here.